Simple in design, the PROSTAT PFC-721 Faraday cup is the experienced ESD practitioner's fastest solution for obtaining approximate charge generation measurements on small parts and assemblies. Designed for use in tight machine spaces, the PFC-721 is used with PROSTAT's CPM-720 Charge Plate Monitor and PFM-711A Field Meter. Devices placed into the PFC-721 share their charge with the cup and the upper sensing plate of the CPM-720. The resulting field measurement on the PFM-711A is multiplied by the cup's correction factor to calculate charge (Q) in nanocoulombs. The PGB-745 Decay Accessories Set is specifically designed for measuring charge movement and decay time across ESD controlled materials. The set consists of two stainless steel electrodes and two very high resistance test leads selected for this application. The high resistance leads minimize leakage during the test cycle and are equipped with male banana plugs. These useful plated steel clips were designed in accordance with ESD Association Standard Test Method ESD-STM2.1-1997 Garments. Attach them directly to a garment's sleeves or hem for making either evaluation or audit resistance measurements. These unique clips are designed for simple connection to a resistance measurement instrument via banana input receptacles. Clip flanges are insulated to provide electrical isolation when making measurements. Use PGC-821 Garment Clips with the PROSTAT PRS-801 Resistance System, PRS-812 Resistance Meter, PSI-870 Resistance/Resistivity Indicator, or any suitable resistance measuring instrument. The PRF-900 is designed to limit probe to sample pressure when using PRF-912 and PRF-914 Miniature Concentric Ring fixtures. It fits snuggly on the fixture’s housing, surrounding the concentric ring pin assembly. As the fixture is pressed against the sample under test, the stopper limits the applied electrode pressure. This assists the user in obtaining repeatable measurements using consistent electrode pressure. PROSTAT Dual Surface Test Bed for use with the PRF-911 Concentric Ring Fixture. The PRS-801-W is a precision milled resistance probe with conductive rubber pad for use with any resistance meter. Used in point to point and point to ground resistance testing of floors, worksurfaces, floor mats or any flat object, the PRS-801-W produces repeatable measurements in accordance with ESD Association standards. The PRS-801-W will work with any other resistance measuring meter for specification measurements. 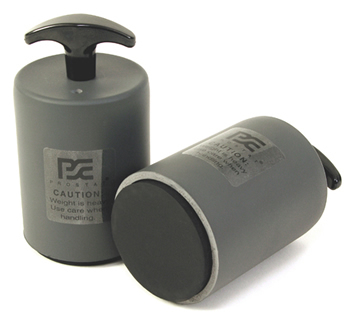 Used in point to point and point to ground resistance testing. Provides repeatable measurements in accordance with ESD Association standards. Weighs 5 lbs. (2.27Kg) each ± 2 oz. Durometer hardness of 50-70, < 1K ohm resistance at 10V on metal test plate. Two stainless steel plates 1/16 inch thick, welded to 1/4 inch stainless steel piano hinge. Equipped with 2 snap connections at opposite corners. Bottom surface laminated with polypropylene insulating material. Stainless steel tube assembly equipped with an insulated sealing cap on end and a banana receptacle for meter lead connection at the opposite end. Equipped with an insulated snap cover and lug type banana receptacle.